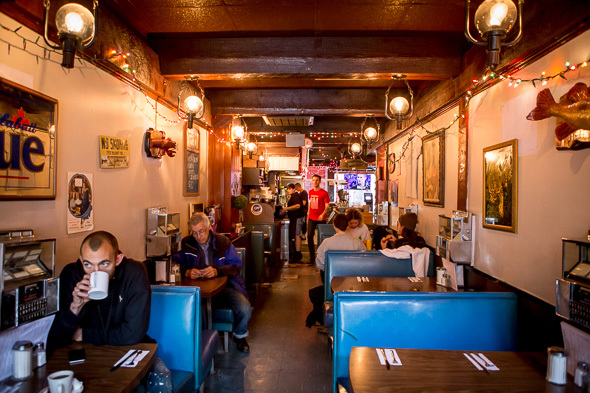 Harry's invites you back in time to 1968, to a diner filled with technicolour twinkly lights, crazy old knick knacks like stuffed animal heads and mounted fish, and loud music. 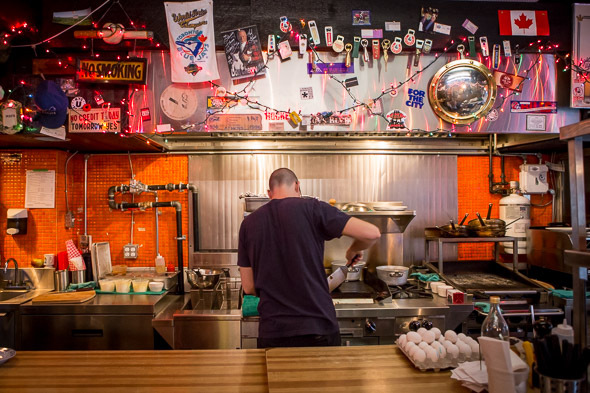 It was once owned by the Petropoulos brothers who pulled fourteen-hour days six days a week into their seventies, but it's now headed up by Grant van Gameren (Bar Raval , Bar Isabel) along with colleague Nate Young. 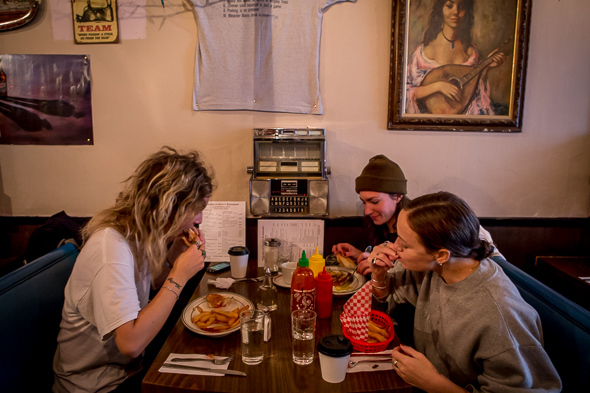 They all lived in Parkdale and came to this place for years, so the takeover is way less about putting a Bar Raval or the like in the Harry's space, and more about passing the torch to younger more energetic restaurateurs. 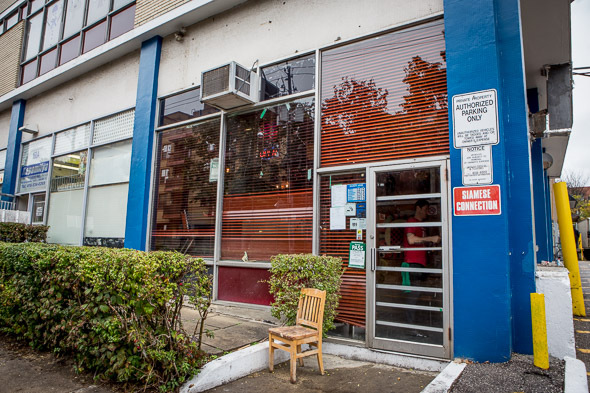 It's not just that you step back in time upon entering Harry's: it's that you step into a specific time, a weird and wonderful twilight that's achieved by always keeping the blinds at the windows front and back almost fully closed. Table seating is gathered around the open kitchen at the front (which they've given a rehaul equipment-wise) and there are more tables and booths at the back. 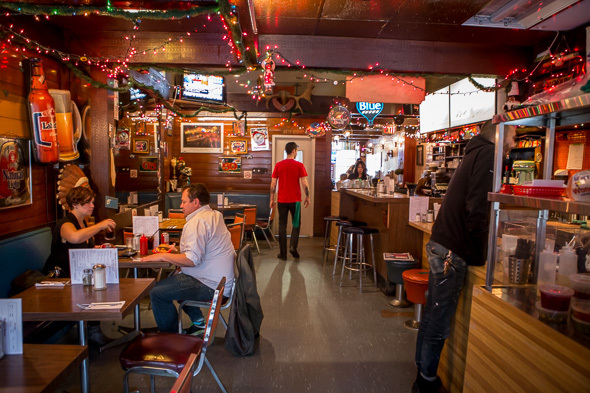 Where better to eat a burger? 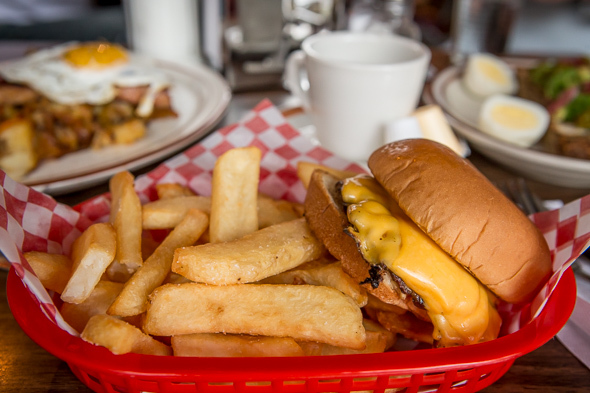 Their plain-Jane burger ($6) is the simplest of affairs, a beef burger topped with nothing more than pickles, onions, ketchup, and American cheese. Served in the classic red basket with thick, golden, rectangular fries, it's totally crushable with no need for dissection. 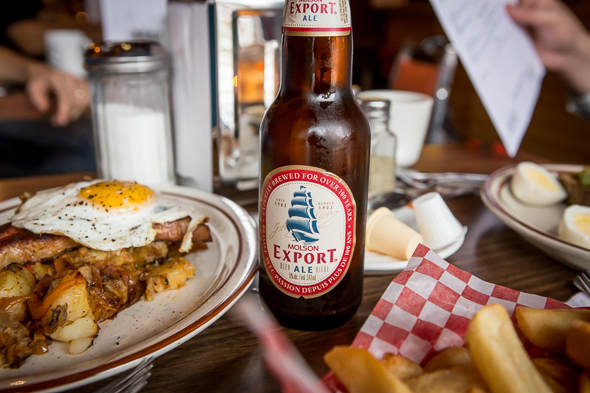 The burgers and breakfast are what people really love about this place. A morning nosh designed perhaps for slightly newer tastes is their avocado toast ($6), a good option for the still-wasted vegetarian in your group. 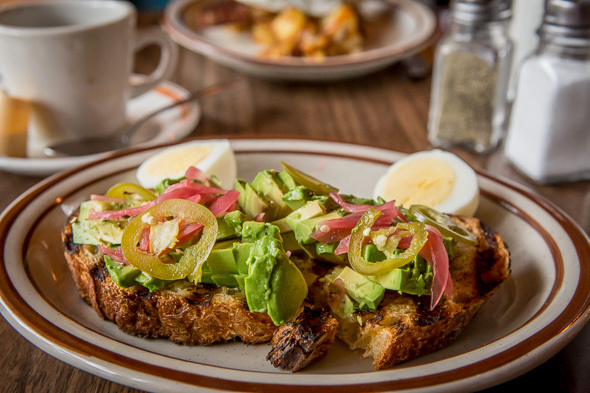 Diced avocado topped with pickled onion and jalapeno is piled on grilled Blackbird sourdough, and it's served with a halved hard-boiled egg on the side. 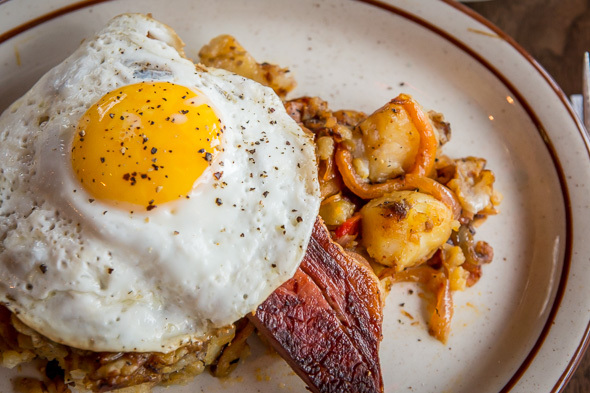 A real standout is the updated corn beef hash ($12). Apparently it's been lightened up a bit so there's no struggle finishing it, and I certainly wouldn't have trouble polishing this off. It's a base of potatoes and onions fried on the grill with stewed peppers which lend a little spicy acidity, topped with a wedge of fried corn beef, pickled onions, and a fried egg. They have a super limited but cheeky booze selection: your options for wine are red and white, and they have two taps and four cocktails, but mostly bottles like 50 and Export ($6 - $8, the fancier end being Brickworks and Guinness). 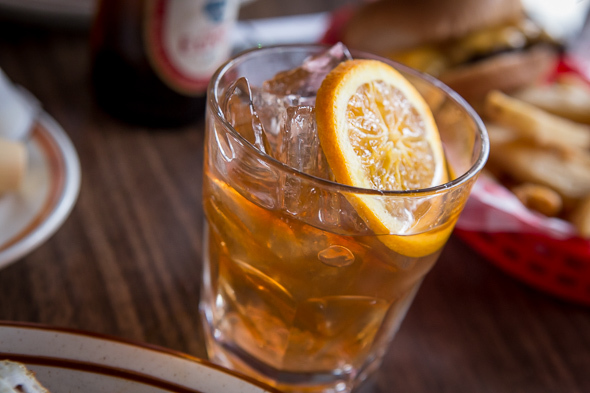 The cocktails are super classic, unshaken and barely even stirred, but my Old Fashioned ($9) is deliciously orangey and clean tasting. Don't forget your wallet at the bar, because Harry's is cash only.